August 18: Given the drenching downpour from the night before, I was kind of surprised to wake up to clear, beautiful skies. All of my gear was still damp--at least the stuff that wasn't just plain wet--but as long as the sun stayed out, it would be easy enough to dry. I had a new worry to think about as well: lightning-caused wildfires. There was certainly plenty of it the night before, but I hoped the rain put out any fires that otherwise might have caused me problems further up the trail. I didn't see any sign of smoke or fires anywhere, though. I hoped it would stay that way. Later in the afternoon, I did see smoke rising from the forests in the distance to the east and south of me. I guessed they were lightning-caused wildfires, but the one to the east was far off the trail and the one to the south was well behind me, so neither of them worried me. Sisters Mirror Lake, with steam rising from the water. I just love watching water do that in the morning! The day's hike was largely uneventful, but I had an idea that I might take a slight detour of the official PCT: Scott Trail. 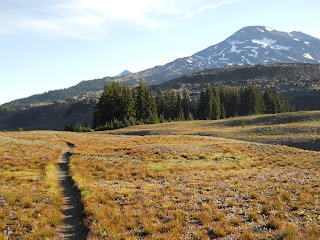 You've probably never heard of Scott Trail, but I read about in Hiking Oregon's History, and noticed that it intersected the PCT up ahead. It was an out-and-back hike, not a loop or an alternate to the PCT. It would be 8.4 extra miles of hiking that would not get me a single step closer to Canada. It was an insane thought for a thru-hiker, to deliberately waste time doing a side trail that would not get one closer to Canada, but I felt I had the time. And, I justified, it would add to my Hike-a-Thon miles for the month (which now numbered about 400 miles). Scott Trail is named for Captain Felix Scott who hired 50 men to build a road from Eugene over the Cascades in 1862. When these road builders neared McKenzie Pass, the biggest obstacles were lava and snow. 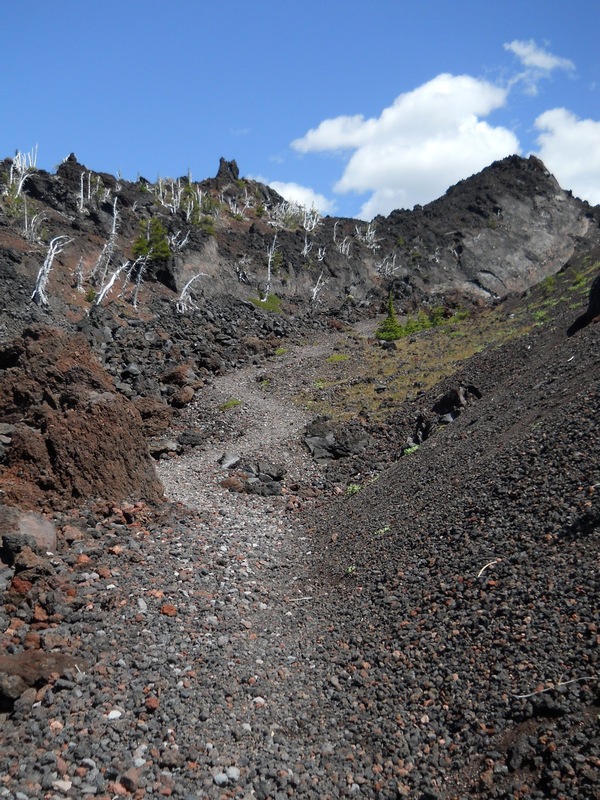 The lowest route through the mountains--McKenzie Pass--crossed miles of jagged lava rock. 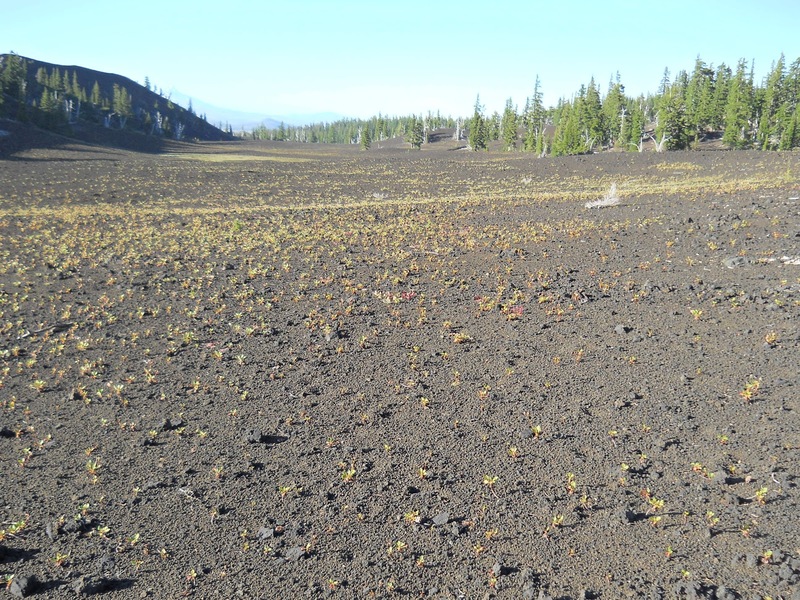 Scott decided to route his road a few miles south, skirting the lava fields to a high notch he dubbed Scott Pass. 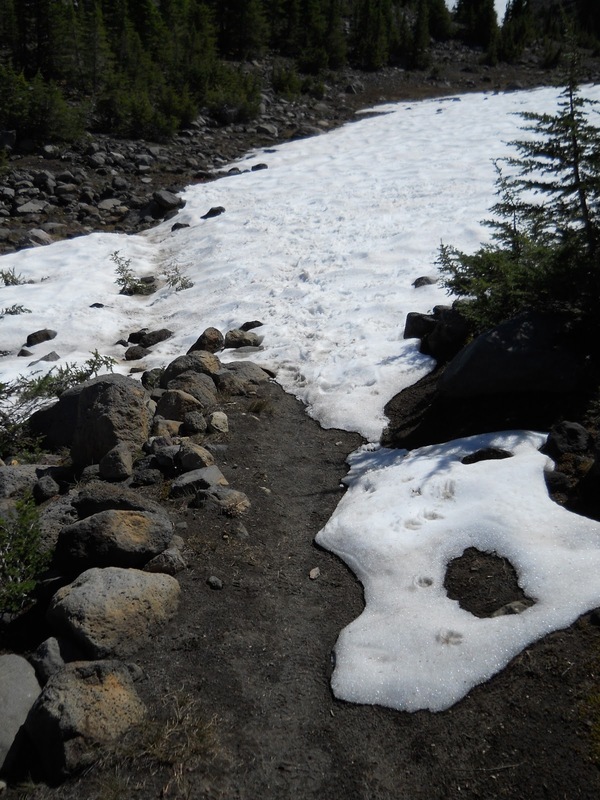 The downside, of course, was that Scott's route climbed a thousand feet higher along the shoulder of North Sister and was much steeper and crossed more snow. One of the hired hands, John Templeton Craig, favored the lower route and vowed to return someday opening a lower route that crossed the lava fields. 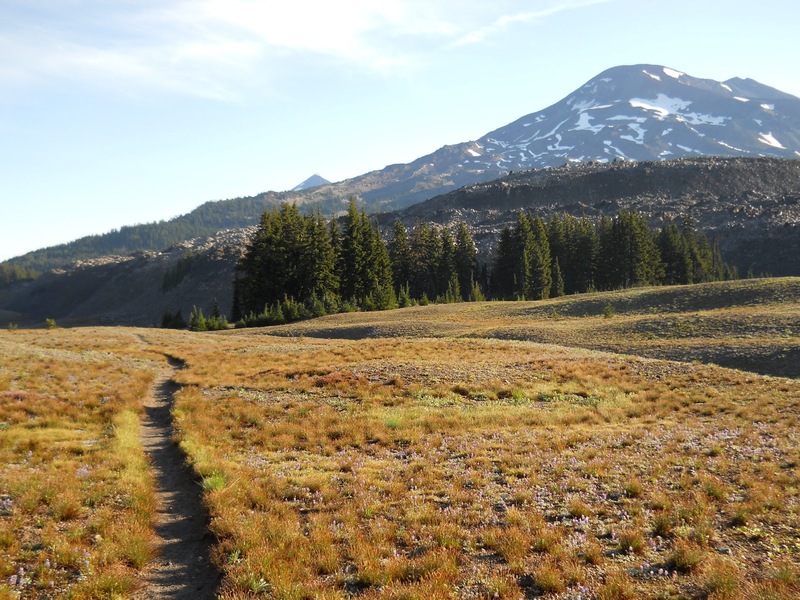 Years later, he did just that, and Scott's route was abandoned, and today it survives as Scott Trail and a path into the Three Sisters Wilderness. I had never done this particular hike before, and here it was, literally intersecting the trail I was hiking. I'd be hiking the trail in reverse compared to the directions in the book, starting at the PCT and hiking to the trailhead then back. Naturally, the book describes the hike assuming you start at the trailhead, hike to the PCT, and back. 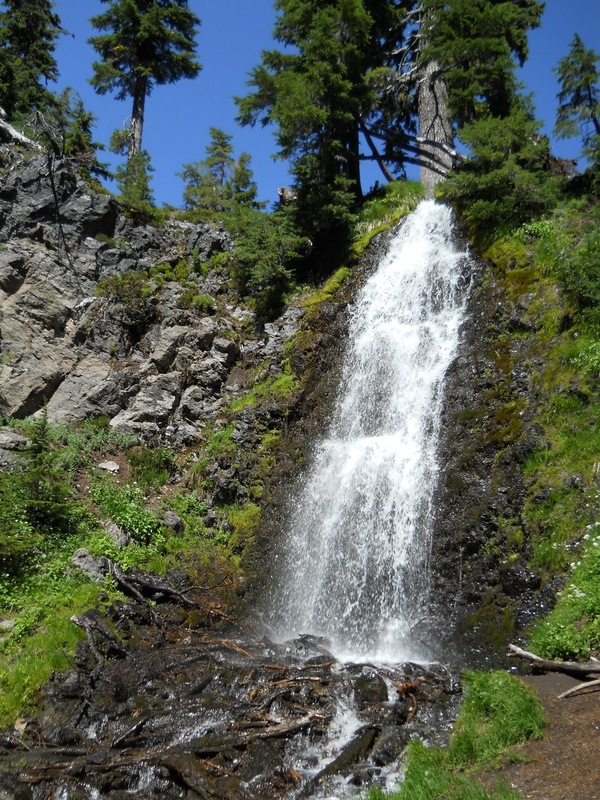 It's described as a "difficult" 8.2 miles with 1400 feet of elevation gain. I had a feeling our definition of "difficult" was quite different, however. Even though I had already hiked 20 miles, I could still do it. The Three Sisters Wilderness was spectacular! This is the South Sister, if I remember correctly. Next, I had to do something with my pack. 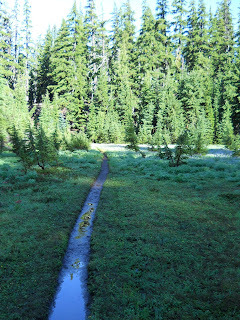 There was absolutely no reason in the world I should carry it 4.1 miles down to the trailhead then 4.1 back to the PCT. My biggest concern leaving it behind was that bears and other animals might try to get into it for the food. So I scouted around for a tree to hang my food from. There was a little controversy about a comment I made back in the High Sierras about sleeping with my food at night, and now seems like a good time to explain my thoughts about bears and food. I'm convinced that the absolutely best way to protect one's food from bears is to not leave it unattended. In all of my years of backpacking, I've met a lot of people who've told me about an instance of a bear getting into their food. The one thing in common in every single case was that they had left their food unattended. Most of the time, they hung their food bags in a tree and a bear had all night to figure out how to get it down and did so. In a couple of cases, someone left their pack at a shelter on the AT went off for several minutes to get water and came back to find a bear pawing through their pack. Regardless of the circumstances, though, in every single case when a bear got into someone's food, it was because the food was left unattended. 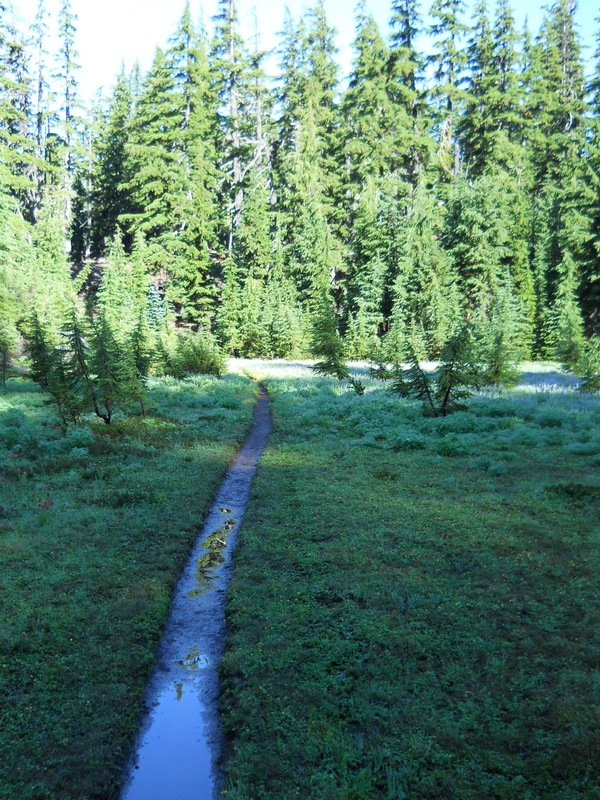 trail was still quite wet in places. Most thru-hikers just sleep with their food, and never have I met someone who's been attacked by a bear because of this. Even though this is probably a hundred times more common than hanging food from a tree, nobody I've met has ever described a bear problem to me from doing this. So I've concluded that people who hang their food from trees are probably a hundred times more likely to have it stolen by bears than people who sleep with their food. In theory, hanging food from a tree sounds good. In practice, it doesn't work out so well. First, you need the Perfect Tree. You'll see diagrams of the Perfect Tree describing how to hang a food bag. The lowest branch is high off the ground, and stretches out far from the tree trunk. The tree is always symmetrical and healthy, full of leaves and probably squirrels. And in all my years of hiking and thousands of miles of foot travel, I have never seen a Perfect Tree. Plenty of Adequate Trees, perhaps, but never a Perfect Tree. And many times, trying to find an Adequate Tree can be difficult. In high passes, there might only be stunted trees around or none at all. In burn areas, you might end up in a forest full of trunks with no branches. And even in a healthy, growing forest, it can sometimes be difficult to find a tree with branches high enough off the ground, far away from other trees with low branches, that has a branch stretching far away from the trunk of the tree. So usually, what ends up happening, is that people find an okay tree and think, "Well, that will have to be good enough." Bears love this. 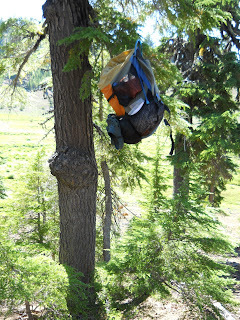 So naive backpackers hang their food bag, far away from camp and people like they've been trained to do, and give the bears all night long to figure out a way to get into the food bag. on occasion. Nothing serious, but still annoying! I'm big enough to admit: I've had no training on hanging food from trees. I've had almost no experience doing it. And I'm smart enough to know that I'd probably do a pretty miserable job of it. So I don't like to hang my food bags. The few times I have done it, I'm nervous all night long that a bear is getting into it and laughing at my expense. Bears, however, are like burglars. They don't want a confrontation with a large, two-footed mammal. That's why millions of people can hike through the woods and almost never see a bear even though they may be all over the place. And bears also know that even if you are asleep, trying to get a food bag that's being used as a pillow will lead to a confrontation. It's true that a bear will win any confrontation--but here's the thing: They don't seem to know that! And frankly, even if they do try to get the food bag anyhow, they aren't looking to kill you. They just want the food. Some areas have known bear problems, and I might be a little more concerned about sleeping with my food in those locations. But where bears do tend to turn into problems, the park authorities invariably have set up bear boxes or bear poles to keep your food safe, and I will happily use those every opportunity I get. Hanging a bag of food from a tree isn't idiot-proof, but bear boxes and bear poles generally are. And if bears are a problem in an area, I certainly don't want to be sleeping with my food. So it's rather convenient that whenever I am in a location with bear problems, I have a safe, effective method to store it. to be seen on the trail. If you choose to store your food using this technique, consider it only a delaying tactic. Be prepared to actively defend your food and repeatedly scare bears out of your camp through the night. Without this negative reinforcement, bears will figure out a way to get your counter-balanced food - some bears will go so far as to literally chew the branch off the tree to get at food bags. I bolded some of my favorite sections of the paragraph. Let's see, I'm expected to actively defend my food and scare bears out of my camp. That's exactly what I do when I sleep with my food. Except that bears have never even tried to get my food in the first place. I'm not convinced that that would happen if I hung my food bag, nor am I convinced that I'd wake up in the night just as a bear was trying to get my food to scare it off. Unfortunately, in this litigious society, people are more interested in recommending bad food storage practices that "guarantee" people's safety than good food storage practices that "in theory" could cause serious injury or death, which is why I think people are brainwashed into always hanging their food bags from trees. Obsidian could be found all over the place here. So, needless to say, I am not a big fan of hanging my food bags from trees. The only time I'd even consider it is if I leave my food unattended. Fortunately, I rarely have any reason to do so. =) Even when I go a tenth of a mile off trail to get water, I'll usually take my pack with me just to make sure no bears (or other animals for that matter) get into my pack. I will leave it behind if other hikers are around, however, since it wouldn't be unattended then. 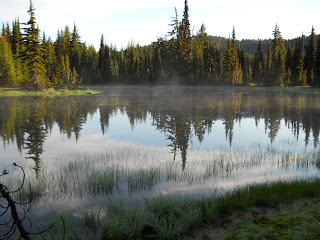 That said, I also did not want to carry my pack 8.4 miles round-trip on the Scott Trail, and there was nobody on the PCT to leave my pack with, nor were their any bear boxes, bear poles, and nor did I have a bear canister available. I only had two options to protect my food: Hanging it from a tree, or taking it with me. And despite my misgivings about hanging my food, the idea of carrying that distance was even less appealing. I decided to take my chances and hang my food. The trail junction with the Scott Trail was in a meadow, and there were very few trees to choose from, but I found one that looked promising up the side of a hill and went to work. I attached a rock to a rope and threw it over a branch, which almost came back and hit me in the face as it cleared the branch, swung down the other side, and it's momentum carried back right at my head. I was thinking about my distaste for hanging food bags, but it hadn't even occurred to me that the practice could actually be dangerous! 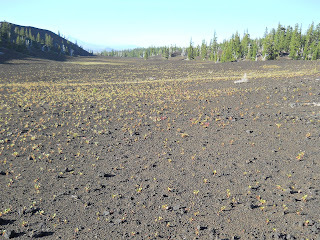 The lava fields near North Sister. I threw the rope over the branch again, this time a little closer to the trunk of the tree so the branch couldn't flex so much that the rope would slide off. I tied the pack on again, pulled the other side of the rope, and... nothing happened. The pack just sat there. Apparently, I'm such a weakling, that I couldn't pull the rope hard enough to overcome the weight of the pack and the friction of the rope against the branch. I also wasn't happy with how close to the trunk of the tree that the pack was located. It was probably two feet away from the tree. Surely a bear who climbed the tree trunk could reach out and get it easy. But if I hung the pack further out on the branch, it would just slide off completely. This unexpected view caused me to lose my breath for a bit! barely discernible--Mount Adams off in the distance. won't even show up for me when I blow up the photo. It's just too small and too far away. I started seriously considering just carrying the pack down the Scott Trail. At least then I knew my food would be safe. I felt absolutely certain that if a bear wanted to get my pack, he'd have no trouble at all. I started doing the math in my head, figuring it would take about 2 hours to hike 8.4 miles if I hike hard (and especially without the weight of the pack to slow me down). What were the chances that a bear would find my pack and pull it down in the next hour and a half? Probably not much. It wasn't even the time of day bears were normally out and about either. I'll just take my chances, cross my fingers, and hope for the best. It was a stupid thing to do, but I really didn't want to carry a heavy pack 8.4 miles and end up right where I started. I had stuffed some snacks and my camera into my waist pack and carried a Nalgene bottle with water for the trek. I didn't want to go completely empty-handed down the Scott Trail! And I was off. I hiked fast and hard. The whole time, I was worried about my pack and its precarious location in that tree. The sooner I got back, the sooner it would be safe. At first, the views from the trail were spectacular! 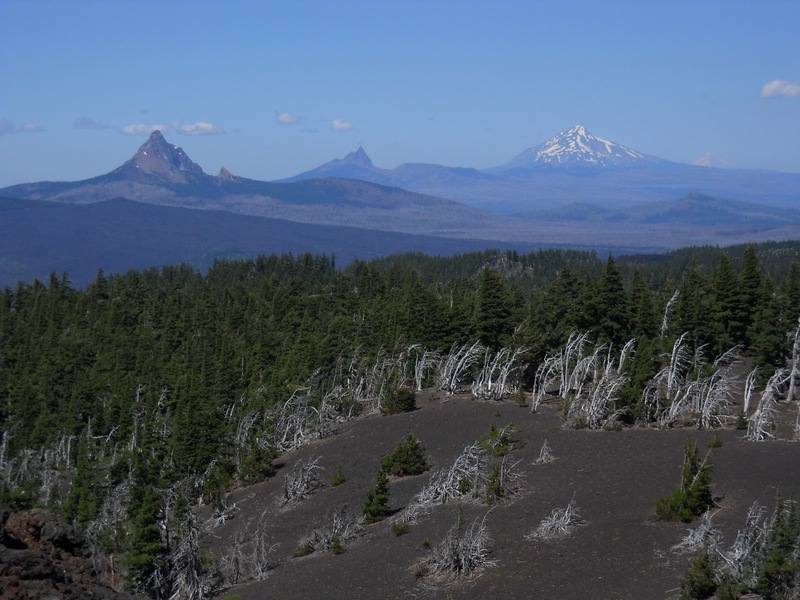 From the wide-open space near Four-In-One Cone, the North Sister stood stall and proud. 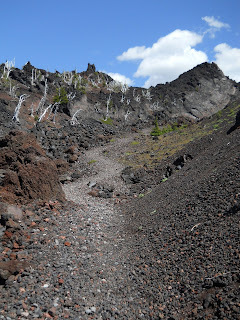 The trail did cross a couple of small sections of lava--this higher route wasn't able to avoid the lava fields completely--and the large hunks of volcanic rock jumbled in piles looked lifeless yet hypnotic. I didn't stop to admire it, though, I needed to rush. I needed to get back to my pack as quickly as possible. About halfway down the trail, it dived into the trees at which point the scenery became exceedingly boring. I was determined to hike all the way out to the trailhead, though, and pushed on. It was hard to tell that a wagon road every went through this area, but occasionally I would notice an unnaturally large gap, a line where large trees didn't seem to grow, and I assumed that must have been the wagon road once upon a time. But I pushed on. 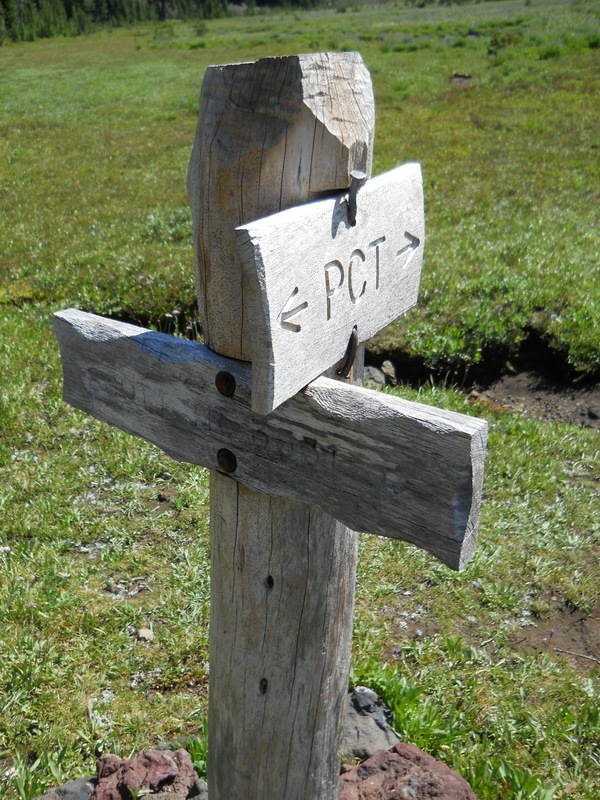 PCT onto the Scott Trail. I reached the trailhead at Highway 242 after about 1.5 hours of hard hiking. I was confused and tired. As fast as I hiked, as hard as I hiked, considering the fact that I was hiking downhill and without the weight of my pack slowing me down, how was it possible that it took me one and a half hours to cover just 4.1 miles? Going uphill certainly would take just as long if not longer. I only expected this side trip to take me two hours, and it was on pace for a full three hours. Ugh. I wished I never made the decision to follow this stupid trail. I took a photo of Highway 242, proof that I really made it that far, I guess, since there's absolutely nothing interesting about the location, turned around without taking a rest, and headed back up towards the PCT. On the way back, I crossed paths with a day hiker. I had passed him earlier on the way down, calling out hello as I tore down the hill but not stopping to talk. I didn't have time to talk. On the way back up, when I passed him again, I did stop briefly to catch my breath and introduce myself more properly. I also mentioned that the Sullivan book described the distance between the PCT to the trailhead as 4.1 miles, but I told him, "There's absolutely no friggin' way that it was only 4.1 miles." It felt like five, at least. The man pulled out his own map--he was also using Sullivan's book as his guide, and had the same map I did. 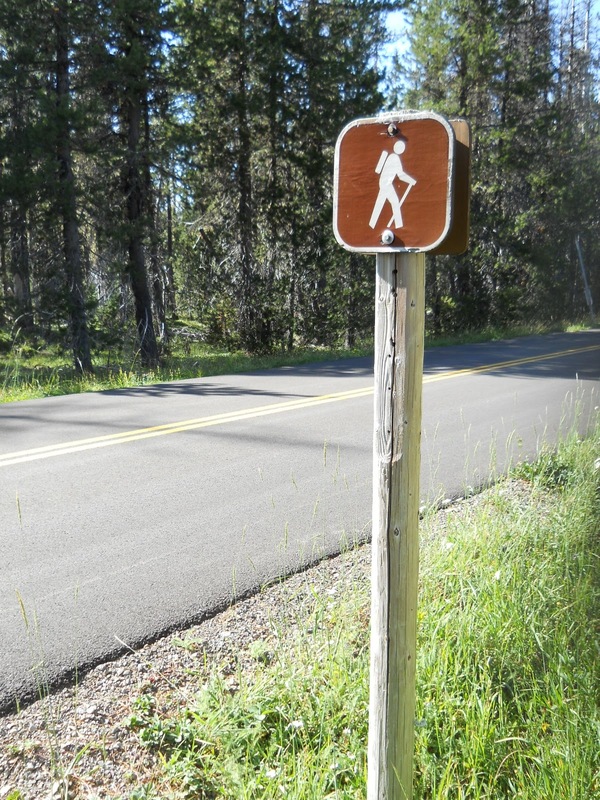 Except that his map described a hike to Four-In-One Cone and back which was 8.4 miles. And that's when I finally figured out what had happened. The distance between Four-In-One Cone and the PCT wasn't included in the mileage at all. The distance I was actually doing was a full 10.0 miles--nearly 20% longer than I anticipated. I swore under my breath. I made it back to the PCT three hours after I left it, looking for my pack in the trees from across the meadow, but didn't see it. I hoped that was a good thing--at least I didn't see pieces of gear scattered across the meadow. I made it to the grove of trees, and found my pack hanging exactly where I left it, undisturbed. Whew. I finally sat down and rested--I hadn't stopped to rest since I left and was absolutely exhausted. 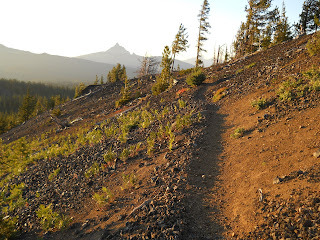 I was now further back on the PCT than I had anticipated as well, and I was starting to worry if I could make it to Sisters by the next day. I knew I could reach the trailhead tomorrow, but Sisters was 15 miles off trail. I needed to hitch down, and if I got there near dark or after dark, trying to get a hitch would be difficult. So I started out again, a little frantic to get as many miles in today as possible. I set my sights on a location about five miles away, which, if I did my math right, would mean I'd have hiked 35.0 miles for the day--a new best! But I had to hustle. The sun was already getting low in the sky. Highway 242 isn't particularly interesting. I started tabulating my miles for the Hike-a-Thon on the little sheet I had to fill out when I discovered an error in my math. I had only hiked 34.4 miles. $^*#! I felt cheated. If I hadn't already unpacked all my gear and settled in for the night, I would have hiked an extra 0.6 miles in the dark just to get a round 35.0 miles for the day. I consoled myself, though, with the thought that 34.4 miles was still a new personal best for myself, and I'd likely have plenty of other opportunities to hike 35.0 (or more!) miles in a single day. I didn't know it then, but this would actually be my single longest day on the trail. I never did do a 35.0 mile day. And with that, I went to sleep. you know sunset is fast approaching! Your pictures just keeping getting better and better. What kind of camera are you using? Pretty much any camera can get decent photos. It's just a matter of getting the right light, the right perspective, etc. That's far more important than what camera is being used. Some days, photos turn out better than other days. *shrug* Just depends where I am and what time of day I happen to pass through. In your picture showing the different mountains, the forest has a patchy look to it. Do you know if those are clear cuts, burnt-over areas, something else, or just an illusion? Thanks. 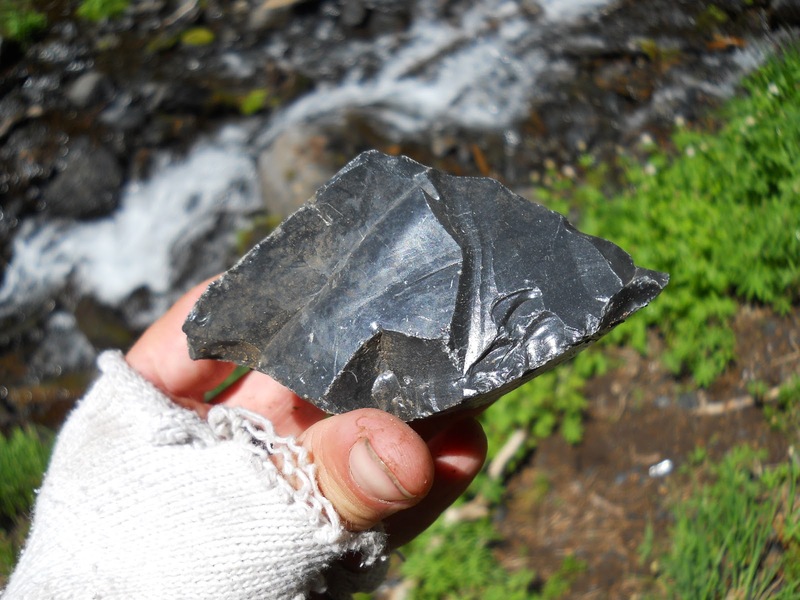 Did you take home a souvenir of Obsidian? That is one gorgeous rock. Or not, because of the added weight? 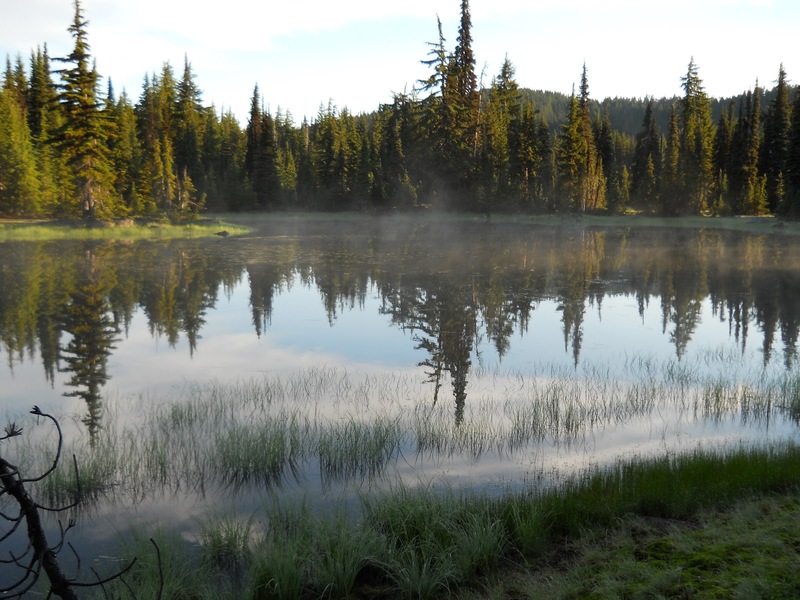 This is a wilderness area, so there's no logging nearby. 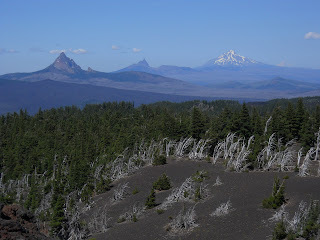 Though admittedly, the view of the mountains stretches well beyond the wilderness boundaries, but most the patchy look is probably a combination of old wildfires (that area had been heavily burned, as you'll see in some photos in the next post), and large areas have no trees at all because the lava flows have been relatively recent (geologically speaking) and *nothing* substantial grows on it (which you'll also see in photos in the next post). I didn't take any obsidian souvenirs. Definitely WAY too heavy to consider! In all the years of back packing, I never hung my back pack for anything. Even to get water or what ever. 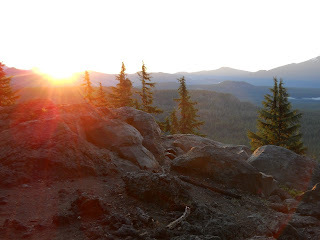 And I spent a lot of time up in the Cascades and the Olympics (bear country). I always slept with my pack within inches of were I slept or used it as a pillow. That picture of your pack hanging from that tree was,excuse me, a joke. A bear, even a cub, would have no problem getting it. I have seen what bears are capable of and what they can do, you were lucky. How were your shoes holding up to the lava, pumice and obsidian on the trail? I have to say, I am just eating up this blog and can't hardly wait till the next capture comes out. Nobody has ever died from my behavior. And don't worry, a bear will not attack me while I'm sleeping in a tent. I don't even carry a tent. And why is it that the same people who criticize me for not hanging a bag from a tree now criticize me for hanging a bag from a tree? I wrote in the post that it was a bad job--and if you want evidence why I should NOT be hanging food from trees, THIS IS IT! It's stupid to hang food from trees, and my actions were no exception, nor did I ever claim they were. Why did I leave it anyhow? I was selfish. One act of selfishness does not constitute a "pattern."